I'll do full photoshoots at some point (which will end up in my collection gallery), but I thought I'd throw a couple of quick pics out there for people. First is the Regent with blue grip, followed by the Mercenary with a Magenta grip. They're both nice pieces and nice additions to the collection. Nice. I sure do love the Pommel on the Regent. The blue grip really work with the Regent!! Very nice additions indeed Chad. Agreed; that blue is spectacular. The magenta works nicely on the Merc as well. Congrats, Chad! BTW, what are you using for the background on your pics? Thanks for posting these, Chad! More to drool over... That blue is pretty sweet, as is the Merc. Might have to combine the two someday for my own consumption. The background is a sheet of off-white vinyl that cost a few bucks at a fabric store. Great pics. Love the blue grip. I love the Regent with that blue grip! Makes it look ever cooler. I like the Merc. grip too, it's very nice and even. Any chance you've done any cutting with either of the pieces? I'd love to hear how they handle. I've cut pool noodles with the Regent. It's a very fast sword. It moves easily through cuts, yet still has a lot of authority. Quite a sword. I'm sure it's no sharper than my other swords, but it feels more wicked or deadly. For more info, Patrick's review of the Regent can be found here. I only got the Mercenary Tuesday, and I haven't had a chance to cut with this one yet, though I have cut a little with a friend's Mercenary (which is why I bought myself one ). In dry handling, it's nice. It's changing my (mis)perceptions of Type XV swords a little bit. It's pretty lively and fast and has more authority in the cut and blade presence than I expected in this type. I'm looking forward to doing some cutting. Both are really sweet. But I think the magenta grip on the mercenary is really sharp. Speaking from my experience, the Merc cuts rather nicely although I've only cut light targets (a horde of invading cardboard boxes ). It tracked fairly well although I noticed a pronounced down-curve to my cuts. This was no doubt due to my skill/edge alignment (first time cutting) and not the sword. 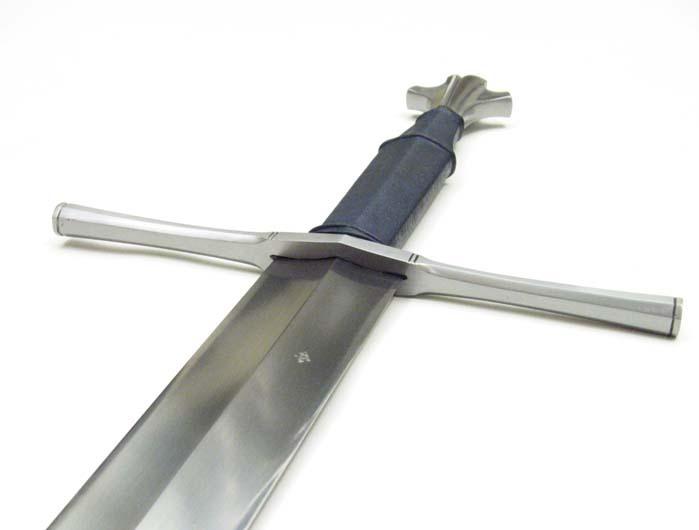 One thing that really stood out to me is the blade's width at the guard (2"+ IIRC). I found it most impressive. I look forward to hearing Chad's impressions since he has more cutting experience than I. I may have more info soon... there was a rumor of invading plotter paper rolls . Is blue a standard option from Albion? I have not seen it offered on thier site, but I was thinking the Munich would be awesome in blue. Even though it is not, the original looks blue in that pic in the albums section, and since first seeing it there I have had blue in my mind. In fact the blue appearance is one the the things that makes that pic most striking. No it isn't. The standard colors on Albion's site are available at no charge. Just about any other color, including blue, can be done as well, though there is a $25 (I think that's what it is) charge for custom colors. 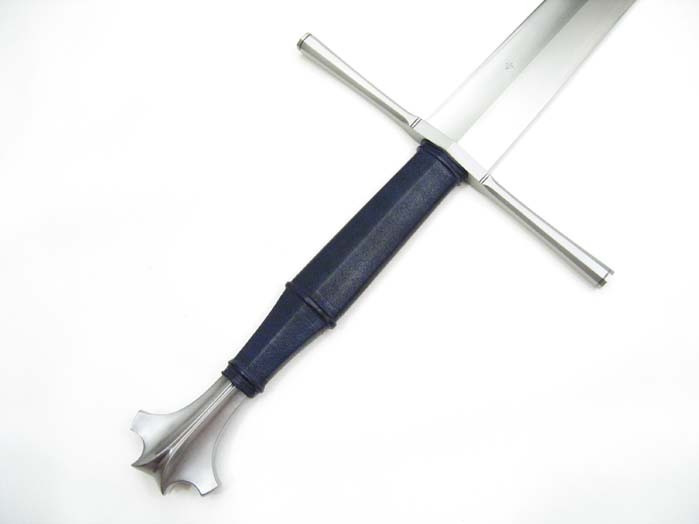 There are actually a few Albion swords in the photo albums that show blue grips, notably Steve Maly's Regent (which inspired me to get mine) and his Prince with a navy blue grip. Grips are offered in black, red, oxblood, or dark brown or light brown (Campaign Worn), for the same price. Custom colors beyond that are available at an additional charge. Please specify grip color choice when ordering. Grip colors may vary slightly due to the authentic processes and natural materials used. The standard colors on Albion's site are available at no charge. Just about any other color, including blue, can be done as well, though there is a $25 (I think that's what it is) charge for custom colors. I'm pretty sure that's right, but can't find where I read that... or maybe I spoke with Mike about it at some point. Ritter - smooth, clean "ring-spalsh"
Brescia - a nice, very authoritative, clean "tink-pop-splash" and the top falls away. Regent - a rather brutal "PING-BAM-splash", still a decent cut, but it just hammers at the target. It shocked me the first time I cut with it - and still amazes me. The blade is so thick, with that hollow-ground diamond, it blows it's way through. I don't know if that adds any clarity or not as to how it performs... it's really pretty awesome. 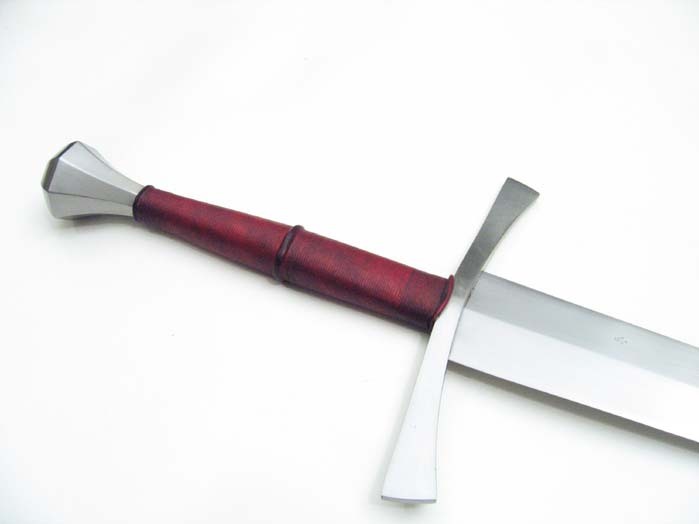 Here's a fun pic of the Regent, which shows a little of the hollow-grinding, and the shape of guard and grip. The second one is a little less over-exposed than the one I posted above, and shows the grip color a little better. Oh sure... rub it in... what are you trying to do to me? 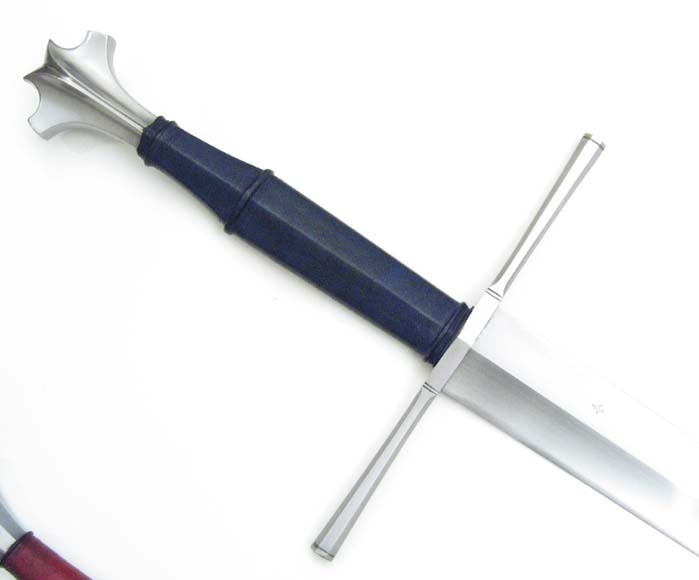 I only noticed now how the central line of the faceted grip is perfectly in line with the rib of the blade, and the center line of the pommel. It's does kind of details that make a sword stand out. Fantastic. You in pain yet, Russ? Chad's most recent couple of pics do give a neat perspective on the piece. I had an idea of how interesting this piece was before I had it in hand, but there are subtleties that you just don't appreciate until you physically inspect and handle it. The blade geometry is fascinating, as are the details Thomas points out here - everything just transitions beautifully to make such a slick, neat piece. It's the first thing you notice when you look at my collection - this piece is the one that stands out.